Drink yourself healthy – transform the way you feel. Find new energy and vitality. Promotes a strong immune system, healthy cholesterol levels and more. Greens for Life brings new energy and vitality, helps improve performance and has a positive effect on your health. Greens for Life is an excellent addition to your daily diet. TEN REASONS WHY YOU SHOULD START WITH GREENS FOR LIFE TODAY! 1. Greens for Life is rich in nutrients that the body needs. 2. The main component of Greens for Life is a powerful 13:1 extract of Barley Grass. Barley Grass (germinated barley) is the most complete food substance we know. It contains very high concentrations of vitamins, minerals and antioxidants and is highly alkalizing. It prevents acidification of the body to neutralize excess acid and restores the proper pH of the body, a prerequisite for good health. 3. Greens for Life contains the unique 100:1 Fruits and Greens, an extract of twenty-seven different types of fruit and vegetables. One gram of Fruits & Greens contains as much bioflavonoids, vitamins, minerals and antioxidants as 100 grams of fresh fruit and vegetables! 4. The spirulina and chlorella in Greens for Life contain over 50 essential nutrients and are a source of chlorophyll (energy from sunlight) that helps maintain healthy blood and promotes the production of red blood cells. Chlorella has a cleansing effect by accumulating waste and removing it from the body. 5. Enzymes control all body processes. 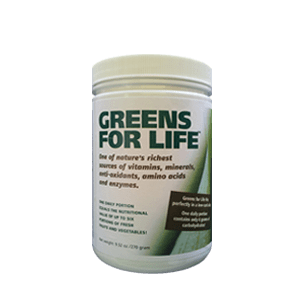 The fifteen enzymes in Greens for Life improve digestion, improve the absorption of nutrients and help the body on all levels to function better. 6. A portion of Greens for Life contains 1.5 billion enteric lactosporen which locate in the small intestine and develop to a full lactobacillen culture. Lactobacilli are ‘good’ bacteria. They promote a healthy intestinal flora. 7. Greens for Life contains Policosanol for a healthy cholesterol level. Policosanol helps reduce cholesterol levels and promotes cardiovascular function. 8. The need for adequate fibre in the diet for proper bowel function needs no further explanation. Greens for Life contains acacia and appelpectin; a wheat-germ fibre known for good digestion, regular bowel movements and a clean intestinal tract. 9. Greens for Life is a powder that easily dissolves in water or juice. This allows the body to absorb all the nutrients better and faster. 10. The food we eat today tends to have too much fat, sugar and refined carbohydrates. Many people no longer have the 400 to 500 grams of fruit and vegetables that the body needs daily. Greens for Life can make up the difference. GREENS FOR LIFE FITS IN ANY DIET! Greens for Life contains only six grams of carbohydrates per serving so is an excellent addition to any diet. Greens for Life fills temporary shortages and promotes normal bowel movement that a ‘low carb’ diet can disturb. It accelerates weight loss and keeps your energy levels up. Greens for Life is a light powder that easily dissolves in fruit juice or squash. Greens for Life has a delicious taste and is the perfect healthy start to the day. Dissolve a full scoop (9g) in a glass of juice or squash – it tastes delicious. Use a shaker for best results. Greens for Life provides a lot of energy so take preferably in the morning or the second half of the afternoon as a quick pick-me-up. Use daily for best results. Greens for Life contains no sugar, salt, colourings, flavourings, or other artificial additives. Greens for Life is low-glycemic and is 100% vegetable. Greens for Life can be safely used by diabetics and is guaranteed gluten free. Regular exercise or excessive use of protein supplements can lead to acidification of the body. Greens for Life prevents acidification and restores the neutral pH of the body which is critical to your health. A pot Greens for Life contains 30 servings and is sufficient for a whole month. Take Greens for Life now and transform the way you feel. 13:1 Concentrated Barley Grass Extract 4230 mg – A supplement with strong basic properties and one of the richest food sources on earth. Fruits & Greens 1150mg – Flavonoid complex consisting of a highly concentrated extract of 1:100 of 27 different fruit and vegetables. Chlorella 300 mg – Contains at least 30 mg of chlorophyll per gram. Spirulina 700 mg – Contains more than 50 important nutrients. Enzyme Complex 40 mg – (From fermented rice) consisting of amylase, lactase, protease, lipase and cellulase. Combined fibre complex 2000 mg – Consisting of soluble and insoluble fibre and apple pectin, wheat germ, micronised wheat bran and acacia fibre. Lactospore 90 mg/1.49 one billion – Enteric coated probiotic lactosporencultuur. Complex Policosanol 30 mg – Hexacosanol, octacosanol, triacontanol, tetracosanol. Acerola with 50% natural vitamin C 150 mg – Contains 80 times as much vitamin C as oranges. Concentrated green tea extract 50 mg – At least 40% catechins and ECGC-polyphenol. Natural flavours 260 mg – Blend of berry extracts.